The anomalous origin of the left coronary artery from the pulmonary artery (ALCAPA) is a rare congenital heart anomaly; this occurs in 1/300,000 live births. ALCAPA syndrome was first described in 1933 by Bland and co-authors in autopsy specimens; however, further description of its clinical manifestations resulted in the naming of Bland–White–Garland syndrome. The case of a 2-year-old boy who was referred for echocardiographic investigation due to recurrent cough, catarrh, and occasional noisy breathing is reported in this communication; his chest X-ray was normal, while electrocardiogram showed Q-waves on limb leads I and aVL and the echocardiographic study showed ALCAPA. 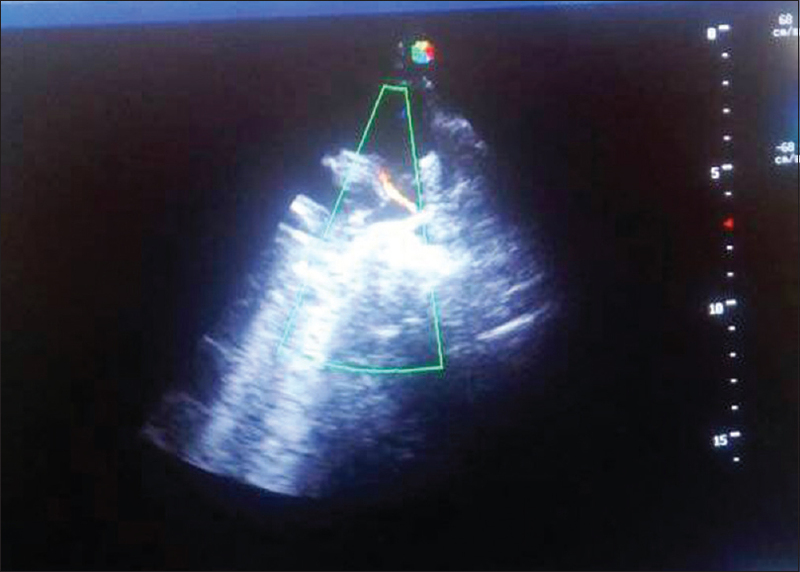 We present the case of a 2-year-old boy who was referred for echocardiographic investigation due to recurrent cough, catarrh, and occasional noisy breathing. He was born of a nonconsanguineous marriage; there was no family history of a cardiac disorder. He had normal growth, development, and general physical examination findings. Cardiovascular examination revealed pulse rate of 120 beats/min, apical impulse at the 4th left intercostal space, and there were 1st and 2nd heart sounds only. 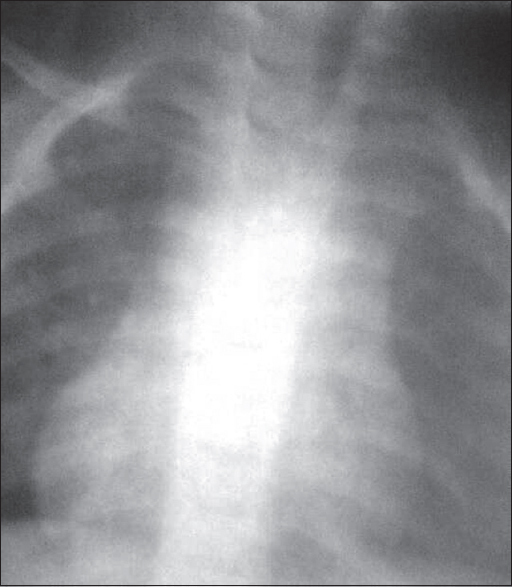 Chest radiography was normal [Figure 1]. 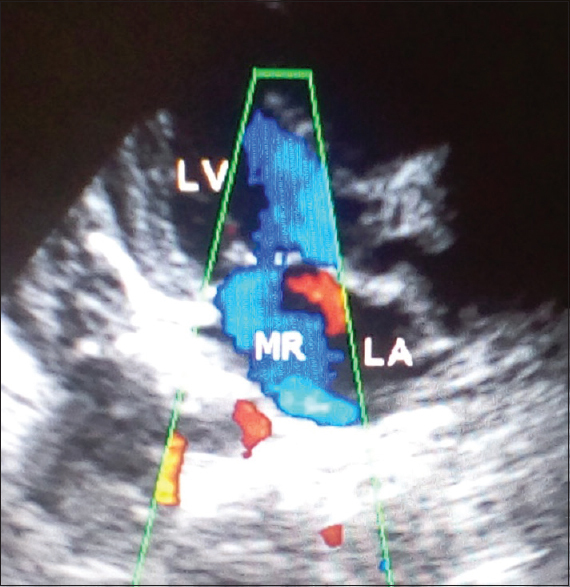 Echocardiographic examination revealed retrograde diastolic blood flow from main pulmonary artery to the left coronary artery by color Doppler study [Figure 2] and there was mitral regurgitation [Figure 3]. The right coronary artery was larger than the left coronary artery. Systolic function was normal with ejection fraction of 56% and shortening fraction of 29%. The cardiac chambers were normal and the left atrial/aortic root ratio was 1.2. The mitral valve was normal and other valves were structurally normal. Electrocardiographic (ECG) findings revealed sinus tachycardia and the presence of prominent Q-waves in leads I and aVL with inverted P-wave in lead III [Figure 4]. Other diagnostic tests such as cardiothoracic angiography and cardiac catheterization were not done because they are not available in our center. Furthermore, the patient was referred for surgical intervention abroad because of lack of facility for cardiac surgery in our setting; meanwhile, the child is still being followed up in our cardiology clinic with his parents being the source of funding. ALCAPA is one of the rare congenital heart anomalies, with occurrence of 1/300,000 live births., Collaterals are often formed between the right and left coronary arteries to enable perfusion of the zones of the left coronary artery.,,, Myocardial steal phenomenon develops as a result of collateral formation leading to right-to-left shunt from the right coronary artery to the pulmonary artery.,,, Although collateral circulation enhances left ventricular perfusion, this may not prevent the development of symptoms except stenosis of the steal osteum which may increase intercoronary perfusion pressure resulting in increased coronary blood flow and delayed presentation, especially in adults. We report an incidental finding of ALCAPA in a 2-year-old boy whose echocardiographic examination and ECG findings are consistent with ALCAPA. 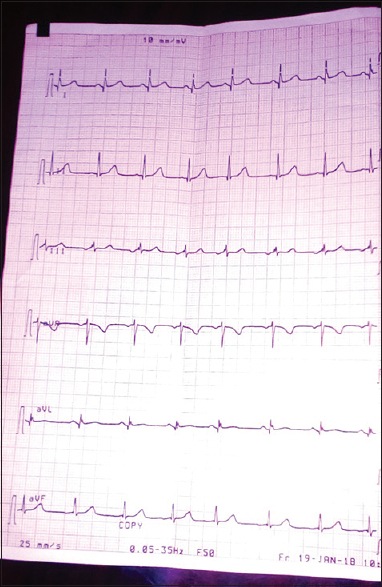 The age of this patient is consistent with infantile type., Presence of Q-waves in limb leads I and aVL was noted in the index case; this was also reported by Perry and Scott. Furthermore, color Doppler echocardiographic assessment may show retrograde diastolic blood flow from pulmonary trunk to the left coronary artery which was demonstrated in this patient, with exception of those that developed pulmonary hypertension in the absence of collateral formation that may need cardiac catheterization for further evaluation. Magnetic resonance imaging, computed tomography, and cardiac angiography are important diagnostic investigations to determine the origin of coronary artery. Management of patients with diuretics, inotropes, and other medications is important in congestive heart failure before surgical intervention. Surgery is the mainstay management by detachment of coronary artery from pulmonary artery and re-implantation of coronary artery into the aortic root. Other surgical methods include Takeuchi procedure. Cardiac transplantation has been recommended in patients with cardiomyopathy not amenable to arterial switch surgery. ALCAPA syndrome is a rare congenital heart disease that has variable clinical presentation. A high index of suspicion is important for early identification and prompt treatment to prevent the development of left ventricular dysfunction and late cardiomyopathy. Echocardiographic examination with color Doppler is essential in diagnosing this disease in a suspected child. Aliasghar M, Mohammed AT, Hassan MM, Nahid Z. The anomalous of the left coronary artery from the pulmonary artery (ALCAPA): A case series and brief review. Int J Pediatr 2016;4:1397-405. Daniel B. Anomalous of left coronary artery from the pulmonary artery. In: Robert MK, Bonital FS, Joseph W, editors. Nelson Textbook of Paediatrics. 20th ed. Elsevier, Philadelphia, USA; 2015. p. 2236-7. Rodriguez-Gonzalez M, Tirado AM, Hosseinpour R, de Soto JS. Anomalous origin of the left coronary artery from the pulmonary artery: Diagnoses and surgical results in 12 pediatric patients. Tex Heart Inst J 2015;42:350-6. Kazmierczak PA, Ostrowska K, Dryzek P, Moll JA, Moll JJ. Repair of anomalous origin of the left coronary artery from the pulmonary artery in infants. Interact Cardiovasc Thorac Surg 2013;16:797-801. Perry LW, Scott LP. Anomalous of left coronary artery from pulmonary artery; Repair of 11 cases, review and indication for and result of surgery. Circulation 1970;41:1043-52. Kreutzer C, Schlichter AJ, Roman MI, Kreutzer GO. Emergency ligation of anomalous left coronary artery arising from the pulmonary artery. Ann Thorac Surg 2000;69:1591-2. Markus S, Omid S, Trace E, Naeem M. Anomalous origin of the left coronary artery from the main pulmonary artery. Circulation 2004;110:e511-3. Malakan Rad E. Anomalous origin of left coronary artery from pulmonary artery associated with pulmonary hypertension. Indian Heart J 2014;66:700-3.